Line a large tray or baking sheet with baking parchment so the paper is really flat. Lay 8 to 10 cocktail or lollipop sticks out on the sheet, spaced well apart. Snap 100 g white chocolate up a bit into a medium bowl. Melt in the microwave in 30-second blasts, stirring between each addition, or set over a pan of simmering water, making sure the bowl does not touch the water. As white chocolate is harder to melt than dark or milk, keep a close eye on it. As soon as it starts melting, stir for a few seconds and remove from the heat. 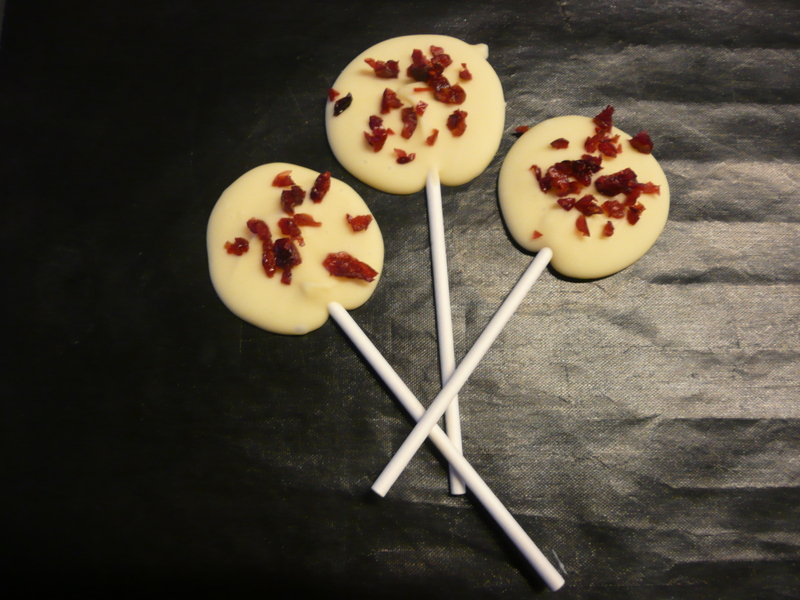 To make disc lollipops, place a spoonful of melted chocolate on top of one end of each of the sticks to give a 4cm disc. Finely chop 1 tbsp dried cranberries and scatter them over the chocolate to stick. Place them in the fridge for at least 15 minutes or until set. Very carefully peel the lollipops off the paper and serve. They will keep for up to a month in the fridge. Use up left-over white chocolate in a blondies, and use up both in white chocolate and cranberry cookies. For Christmasm I was in charge of – surprise, surprise – the dessert. I didn’t want to make the traditional log, as I’m not a huge fan of that, so I opted for this modern version. I came across this recipe in a magazine. It’s a recipe from Joost Arijs who owns a patisserie & chocolaterie in Ghent, called, of course, Joost Arijs. 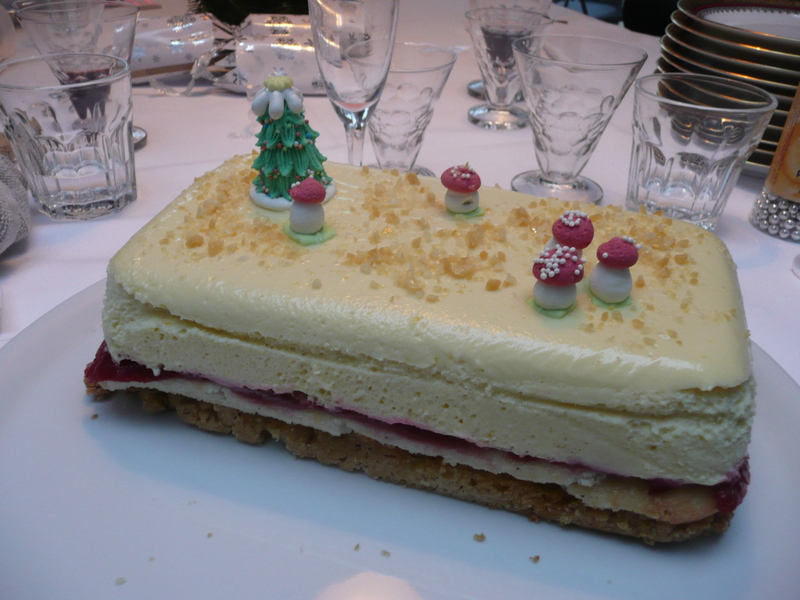 It’s made of white chocolate mousse, red fruit coulis, almond sponge and almond crumble. The recipe indications where very fragmented, so I consulted other recipes as well to get the desired result. Also, I figured not everyone is a fan of white chocolate because it’s very sweet, so I created a dark version as well, I’m calling it Buche Nero and I’ll be adding the recipe soon as well! But first for the Buche Nevado. I don’t have a buche mould, so I opted for a normal rectangular loaf tin instead. I did some tests on how to best get a chocolate mousse out of it, and 2 options work best: adding the chocolate mousse straight to the mould and then going round the mould with a blowtorch to melt it a bit so it slides out or, if you don’t have a blowtorch, oiled cling film. So to get started, line your mould with cling film that you first brushed with olive oil (if you don’t have a pastry brush, just put some oil on a paper towel and wipe that on the cling film. Put 2 sheets gelatin in cold water to soften. At this stage, the recipe suggests making your own coulis by mixing 150 g red fruit, passing it through a sieve and adding 25 g sugar. Or you can use the shortcut and just buy raspberry coulis as I did. The next step is identical: heat the coulis (if making your own, you want the sugar to have melted) until boiling, then take it of the heat and add the sheets of gelatine (squeeze the water out first). Pour onto a baking sheet lined with baking parchment or oiled cling film and put in the fridge to set. You can do this 2 days in advance. At this point, the recipe just indicated to make a mousse with the ingredients, so I opted to use the “no fail” recipe of Piet Huysentruyt, a Flemish Michelin-star-turned-TV-star instead. 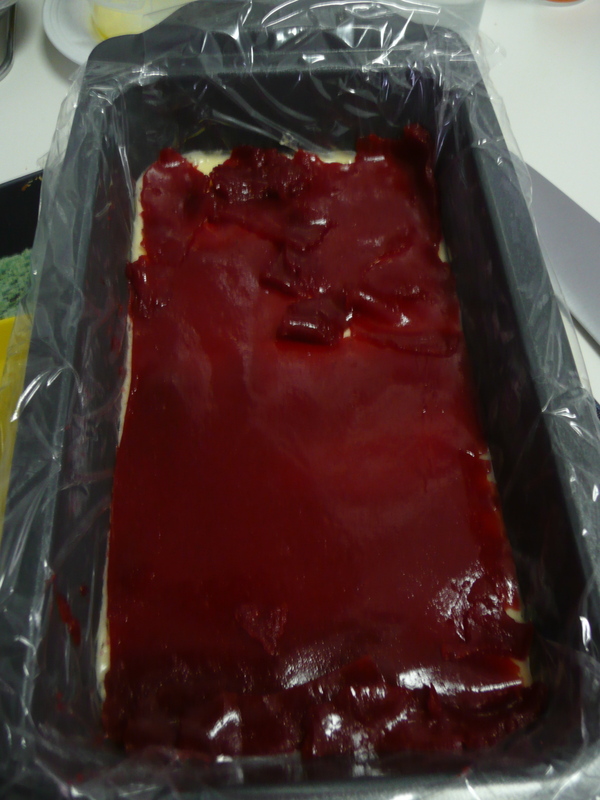 First, put 2 sheets gelatin in cold water to soften. Heat 400 g white chocolate in 1/2 dl cream (adding the cream will avoid burning the chocolate) and stir until melted. Squeeze the water out of the gelatin and add to the chocolate. Seperate 4 eggs and mix the egg whites until stiff (you need to be able to turn the bowl upside down and that’s no joke!). Add 50 g caster sugar and mix again. Now mix 1 and 1/2 dl cream until you see the trace if your mixer in it. You still want it to be half runny, if it’s too stiff it will split. Finally, mix the egg yolks with 50 g caster sugar for 5 min until they are foamy and almost white. 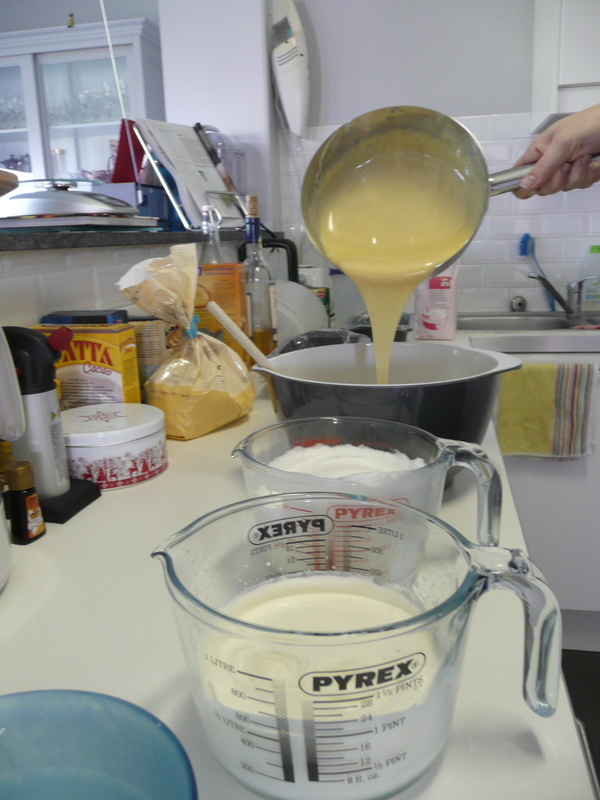 If you do the mixing in this order (egg whites – cream – egg yolks) you don’t need to wash it in between! Now you’re ready to assemble: first mix the chocolate with the egg yolks. Now fold in the egg whites and finally add the cream. You want to fold in the cream quite quickly to avoid it splitting. Pour in the prepared tin until half full and allow to set in the fridge. You can do this 2 days in advance as well. Tip: if you’re just interested in the chocolate mousse and have no desire to turn it into a log, this recipe will easily serve 4 to 6 people. Just pour into glasses and put in the fridge to set. You can decorate it with some red fruit for a gorgeous dessert. Preheat the oven to 170 C and line a baking tray with baking parchment. Put 75 g almond powder in a bowl with 30 g icing sugar and 12 g plain flour and stir to combine. In a separate bowl, mix 90 g egg whites (from 2-3 eggs) until stiff, then add 50 g caster sugar and mix again. Carefully fold the egg whites into the almond mix until combined and spoon onto the baking sheet in a rectangular form, about the size of your loaf tin. Use a knife to nicely flatten the top. Bake in the oven for 10 min until the sponge is lightly golden and springs back to the touch. Remove from the oven, turn it out onto a sheet of lightly sugared baking powder, carefully peel off the lining paper and lay it back over the sponge. Allow to cool completely. Turn the oven up to 180 C. Mix 100 g plain flour with 100 g almond powder, 100 g sugar, 1 g fleur de sel or salt and 100 g butter until it resembles bread crumbs. Put on a baking sheet lined with baking parchment, roughly the size of your loaf tin, and bake for 12-15 min until golden brown. Remove from the oven and leave to cool. Now you’re ready to assemble. Y ou already added the chocolate mousse to your loaf tin, and by now it is set. Take the coulis out of the fridge, cut it to the same size as your loaf tin and put it on top. Don’t worry if you need to patch it up a little. Now do the same with the sponge and finish with the crumble. Make sure to turn the crumble upside down for this, so that the flat part is on top. Put in the fridge again until you are ready to serve. When ready, turn out onto a serving plate (use a blowtorch to loosen a bit if you have one (if the chocolate is too runny after that, just put it back in the fridge for 15 min or so to stop it running), if not just peal of the cling film) and decorate as desired. Cut into slices and enjoy! Chocolate always does the trick when it’s cold and dark outside, and if you add even more chocolate to them, you can hardly go wrong! That’s why this seemed the perfect recipe for a batch of cookies to take with us when visiting a young family. In return, we got chocolate cake with our drink which was delicious too! 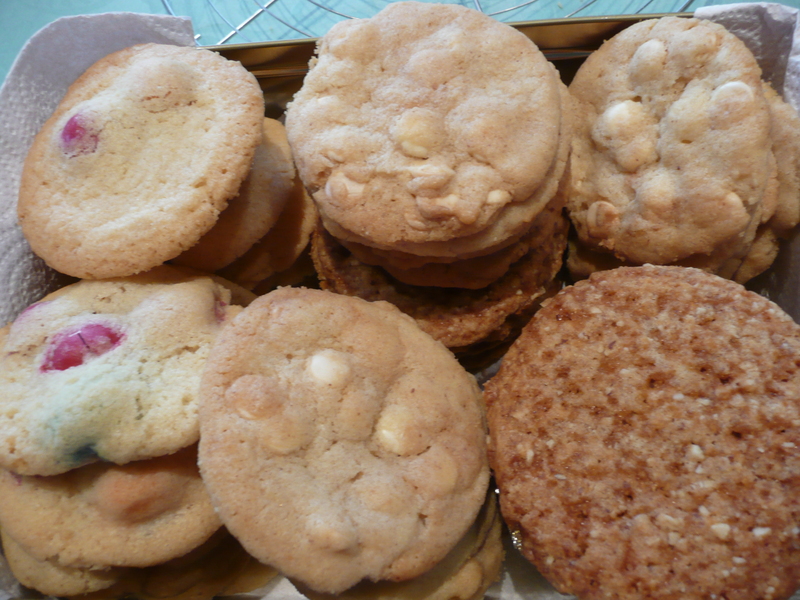 This recipe again comes from my book “Les cookies de Laura Todd” which is rapidly becoming a household favourite. 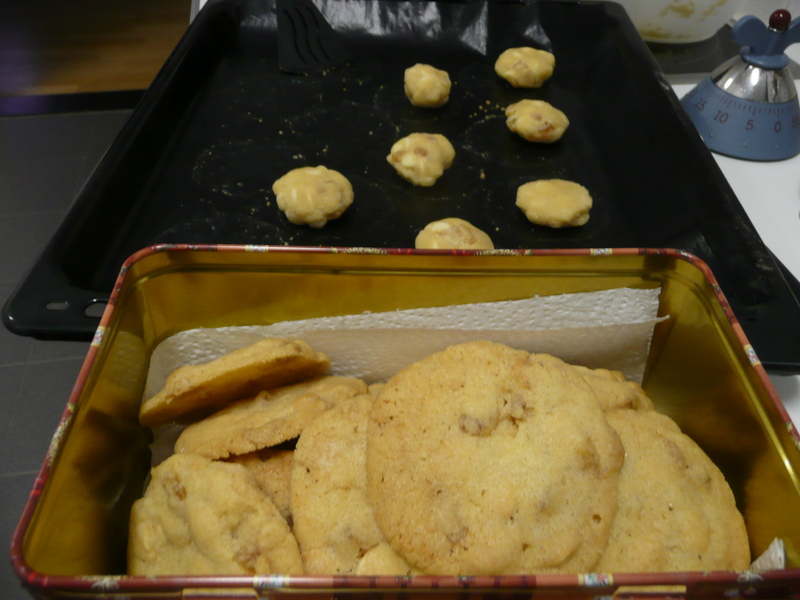 Preheat the oven to 140 C. Mix 250 g softened butter (or margarine) with 350 g soft brown sugar. Add 1 egg and mix again. Add 375 g self-raising flour (or use regular flour and add 1 tsp baking powder as well) in 2-3 batches, a pinch of vanilla powder (I used a small bag of vanilla sugar, you could use 1/2 tsp vanilla extract of the seeds of half a vanilla pod as well), a pinch of salt and 50 g cacao powder (I didn’t have that much left in my box, so I ended up using only 25 g, which worked just as well. Just to say that you don’t need to stress over the exact measurement) and mix well. Add 375 g white chocolate chips or chopped chocolate. Using an ice-cream scoop, take a scoop of dough and release it on the baking sheet. Flatten it lightly with the back of your hand. Space the cookies well apart as they will spread to a diameter of 8-10 cm (if that’s too big for you, just roll smaller balls with your hands, that’s what I did for this batch). Put in the oven for 15-20 min. Leave to cool for a few minutes before transferring to a wire rack to cool completely. Or eat them still warm with a scoop of vanilla ice cream and a hot chocolate… Enjoy! 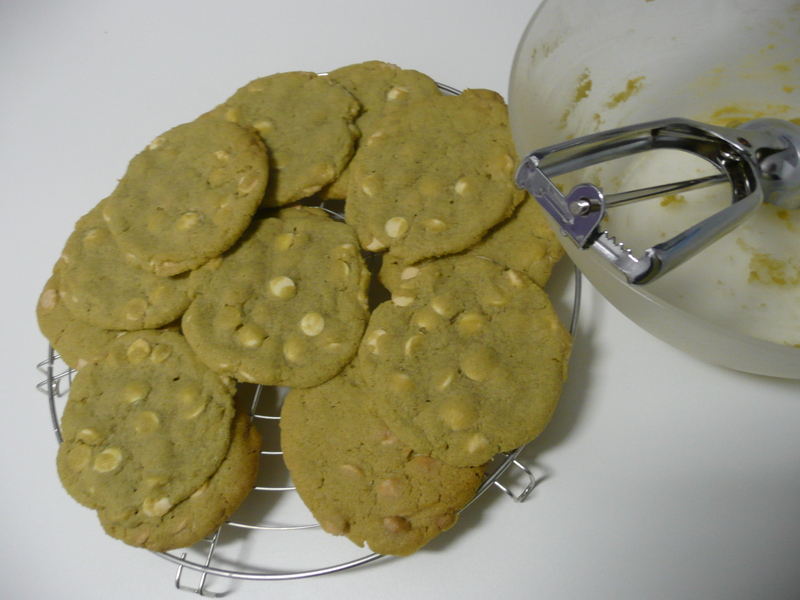 I bought a batch of green matcha tea powder a while ago and now I finally got round to using some in these delicious cookies! I used white chocolate so they were very sweet, but you can use dark chocolate too if you prefer. 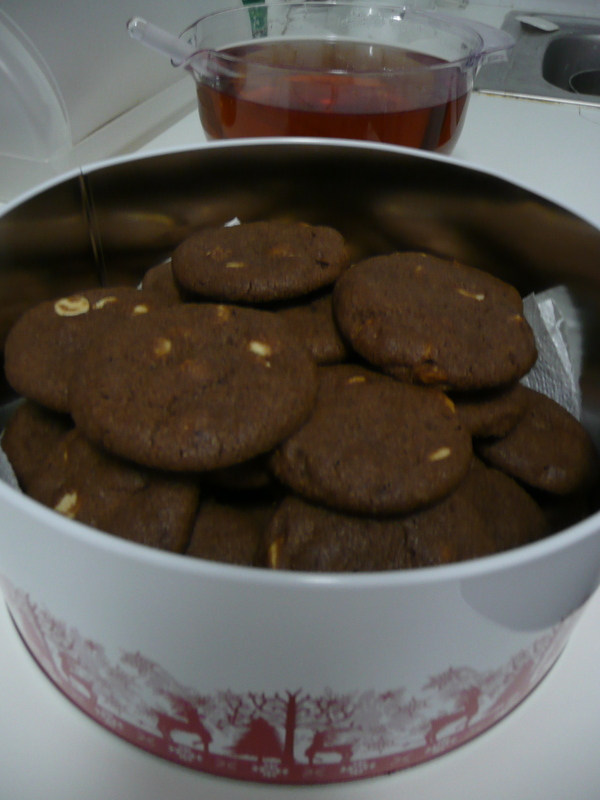 I found the recipe in a small French cookbook full of American style cookies, called Les cookies de Laura Todd. A colleague of mine who knows my love for chewy cookies recommended it to me and it turned out to be a fabulous tip, I’m totally loving the book already, so watch out for more tasty recipes in the future! Preheat the oven to 140 C and line two baking sheets with greaseproof paper. 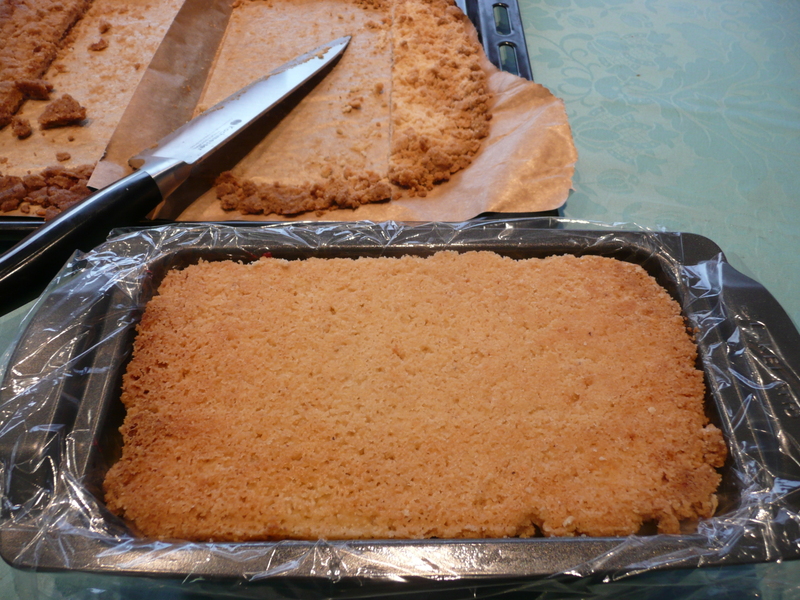 Mix 250 g softened butter (you can use margarine as well) with 350 g soft brown sugar until fluffy and soft. Add 1 egg and beat well until incorporated. In two batches, add 375 g self-raising flour (or use regular flour and add 1 tsp baking powder as well), a pinch of vanilla powder (I used a small bag of vanilla sugar, you could use 1/2 tsp vanilla extract of the seeds of half a vanilla pod as well), a pinch of salt and 1 tbsp green tea in powder and mix well. Add 380 g white chocolate chips or chopped chocolate (you can use dark chocolate as well or split the dough in half and add 190 g of each to make two types of cookies).